A really fun and unusual shoot for a software product launch. Here animation director Gabriel Polonsky works with actress Joanna Herrington using an animation technique called ‘pixillation.’ It’s a perfect application for shooting with a DSLR (digital SLR camera), in this case Canon’s 5D Mark II. 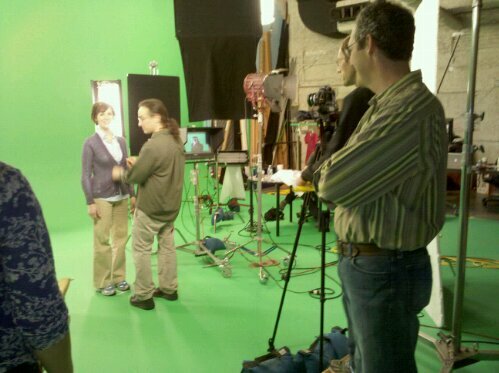 Using the camera in “still” mode, DP Mark Wuerthner shot hundreds of images as Joanna patiently posed for each one. 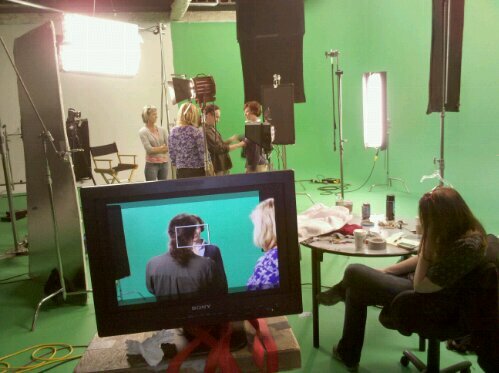 The idea of this corporate marketing video is that the actress will walk through several changing work environments – hence the green screen. We’ll composite her into those background environments later. Adding some visual “spice” is the pixillation, a technique that takes stop-motion animation and applies it to human beings. We’ll the post the video when it’s finished so you can see what that means. All I can say is that Joanna did an amazing job in her role as puppet! In much of the finished video, the actress – moving in normal motion – will operate the software in a futuristic environment. For those sections, we switched modes on the Canon to shoot 1080P video. To check our work on the set, I downloaded video and stills from the card into a laptop with After Effects. This allowed us to check how well the actress would “key” out of the background, as well as how our animation was progressing. All in all a great day – making good use of technology in the service of a really cool idea. Filming, Shooting, Lensing, or WHAT?